I HOPE YOU LIKE MY WORK AND FIND SOMETHING TO INTEREST YOU! My work is drawing based, as this is the essential starting point for me. I like to work with observational studies, and also exploration of the quality of various media, to create lively textural surfaces. My work is figurative, and the inspiration comes from nature, architecture and urban scenes. I enjoy travel and recording the beauty and life of different cultures. I love France particularly; its light and colour, medieval villages and its landscape. Much of my work is also based around coastal and inland water scenes, with a particular love of boats and harbours. I studied for a degree in Illustration as a mature student, and also a PGCE in secondary art teaching. I did not pursue this career move , however, prefering to organise art classes for adults, part time. For some years I worked as a course tutor for London Art College, and was able to help structure the courses on Landscape and Portraiture. On leaving college I did complete some illustrating commissions, and also worked with a framers, which introduced to me to the practicalities of this art. I have had several solo exhibition at various venues, and also have shown work with open Exhibitions and Art fairs. I have been a member of Bath Artist Printmakers, Artist in residence art agency,Shepton Mallet Artists and the Society of Graphic Fine Artists. 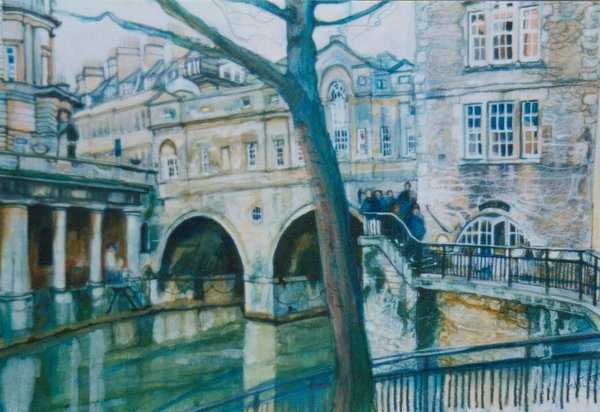 While I lived in Bath, I was also involved with the Bath Area Network of Artists, and the Fringe art fair. I also have an interest in Life Drawing and have been involved in organising local classes. I have taken part in the Roundabout Arts trail for Saltford and Keynsham and am a member of Cam Valley Artists, Old Bakery Artists, and Clifton Art Club. My most recent venture into abstract art came through a course at St. Ives Painting school, and I am working on several pieces based around views of that area. We have returned to live in Bath, and I have taken part in Widcombe Arts trail and in Sept,will be involved with a newly formed Combe Down Arts trail.